The match-up press is a more complicated "system" of presses than simple zone presses. The match-up press was developed and fine-tuned by Coach Rick Pitino, originally at Kentucky years ago. 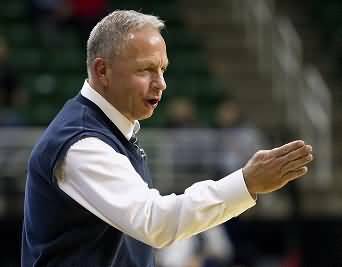 At the high school (and on a more personal) level, coach Keith Haske has developed a complete system of match-up presses, applicable for athletic high school teams. The match-up press is more difficult to learn than a zone press and involves a fair amount of practice time. But it has the advantage of always having pressure on the ball no matter what press-breaker alignment the offense uses. The match-up press is different from a zone press in that we have our defenders all match-up with someone when the ball is inbounded... much like man-to-man defense, so it doesn't matter what press-breaker the opponent uses. One tall defender is on the inbounder trying to tip the inbounds pass. The other four defenders match-up man-to-man behind their man (unless we are in a full deny pressing situation). Rather than playing an area or "zone", our defenders follow a set of press rules. In addition to putting pressure on the ball at all times, we use helpside rotations and interceptors and several other tactics.... (1) force sideline and then "cut and double", (2) "run and jump", and (3) "run and double". Let's first discuss these tactics. We use the "cut and double" tactic along the sidelines. X5 will try to force O1 to speed-dribble up the sideline, and will then sprint ahead of and "cut" (stop) O1 somewhere along the sideline... this could happen either before or beyond the half-court line. X4 runs along with his/her man, even with the ball. As soon as O1 is stopped, X4 will immediately sprint over to trap O1. Oftentimes, O1 will spin backwards away from X5 and toward the sideline, and this is a great time for X4 to trap and actually steal the ball, since O1, while spinning, is "blind" to the trap coming from behind. "Run and jump" techniques can be used not only in full-court presses, but also in half-court trapping, man-to-man defenses. We use it in our match-up press too. One of our press rules is to run at and double-team the ball anytime the ball is being speed-dribbled toward you. This could happen in the middle of the court, or along the sideline. Ordinarily, we only trap along the sidelines, not in the middle of the court. So, in the middle, it's usually a "run and jump". In diagram A, O1 is speed-dribbling toward the middle, at X1. X1 sprints at O1 and contains the ball. If O1 immediately passes to O4, the defenders switch and X5 "jumps" to cut and contain O4, while X1 now has O1. It is easier for X5 to jump to O4 because X5's momentum is going in that direction. It would be nearly impossible for O1 to turn around and sprint back to O4. So a "run and jump" is basically a defensive switch that occurs when the ball is being speed-dribbled at someone, and then passed. Now if O1 had stopped the dribble, we would have both X1 and X5 stay in the trap (a "run and double"), until the ball is passed out of the trap. The advantages of running at the ball when it is being speed-dribbled at you are: (1) it may cause the speed-dribbler to turn the ball over with a ball-handling error or a bad pass, (2) it helps slow-down and contain the dribbler, (3) it could result in a dead ball and a trap, and (4) gives us a chance to "turn" the ball back to the sideline or the opposite direction. In diagram B above, we see that after the "run and jump" (diagram A), O1 kept (did not pass) the ball, and X5 has jumped to O4. Now X1 is containing the ball (O1) and has forced O1 to turn back to the sideline where we once again can try to "cut and double". Here are several situations where we will "run and jump". See the diagrams below. We may trap the inbounds pass. If O1 immediately passes out of the trap back to the inbounder O3, X5 "jumps" to O3, because X4's momentum is going away from the ball. In the middle diagram, we have already seen above how to handle the "run and jump" in the middle of the floor. In the right hand diagram, we may at times "run and jump" the sideline dribble. Sometimes, our X5 is just not quick enough to cut O1 speed-dribbling up the side, so we may have X1 "run and jump" O1 instead. If O1 stops the dribble, X1 and X5 both stay in the trap, if O1 passes ahead to O4, X5 sprints forward and "jumps" to O4. A "run and double" can also occur when the ball is being speed-dribbled at someone. Since we don't usually try to trap in the middle of the court, we will use this more along the sidelines. As the ball is speed-dribbled up the sideline, our X1 defender comes up and "hits" O1, and X1 and X5 trap O1. Our X3 helpside defender will rotate over to intercept the next pass up the sideline, while our X2 helpside defender will sprint back to defend the paint (see the rotations below under "1-Up"). There are a few situations where we may "run and double" in the open court... (1) the speed-dribbler stops the dribble and we stay in the trap, (2) when the ball-handler is not a great dribbler and folds under pressure, and (3) at times, we will "run and double" whenever their best player receives the ball, just to make him/her work harder and give up the ball. Note that a "run and double" becomes a "run and jump" as soon as the ball is passed out of the double-team. You can imagine that with using the tactics described above, the match-up press entails some risk and you have to be willing to accept that you might give up a few lay-ups in transition. But, overall when run effectively with energy, you will gain in turnovers, interceptions, and your own lay-ups. Additionally, over the course of the game, the opponent will become fatigued. Thus to run this press, your athletes must be well-conditioned, and it helps greatly to have a deep bench. After we score, our post players are right there under the basket already in position to press. Our taller player on the inbounder may block the inbounder's passing lanes and may tip the inbounds pass and go score. We don't expect our post players to contain a quick offensive point guard... just force him/her to speed-dribble to one side or force him/her to pass. We want our quicker players as pass interceptors and trappers. We especially like to have a very quick, athletic player in the X3 spot... this is our back defender who reads the defense and intercepts passes. Already we can see things are a lot different with this press than with a zone press. I will discuss the various alignments and adjustments later, but first there are basic press rules that apply to all of the variations. X4 plays the inbounder and tries to tip the inbounds pass. Try to force the inbounds pass to the corner. "Play someone" - basically matching up with every defender on a man. We may change from 1-Up, to 2-Up, to 3-Up, or 4-Up depending on how the offense is aligned. Always pressure the ball and try to force the ball-handler to speed dribble. If someone is speed dribbling toward you, sprint at her/him to trap ("run and double" and "run and jump"). When this happens, teammates will rotate to give help and become "interceptors". X4 and X5 double-team the inbounds pass in the corner if the ball is even with or below the block. If the inbounds pass goes beyond the block, X5 pressures the ball forcing the speed-dribble, while X4 quickly sprints to get above the ball. We will usually switch any early screens that try to spring someone loose. Communication, calling out the switches, is key. "Go with your man". If your man goes deep, and someone is not speed-dribbling at you, go with your man. If the ball is dribbled away from the sideline back toward the middle, X4 is in position to "hit" the ball-handler there ("run and double" or "run and jump"). If the ball is dribbled up the sideline, it will eventually be trapped near half-court (a "cut and double" or a "run and jump"). If the offense gets the ball into the opposite corner (or the inbounder runs the baseline), use all the same rules, just on the opposite side. If the ball gets ahead of you, sprint back and try to "back-tip" the ball loose from the dribbler. Sprint back to the paint when you are beaten. Sprint out of the double-team if the ball is passed. When trapping, or trying to stop the dribbler, you must move your feet to get into position. Don't reach in and just swipe at the ball. Back-court fouls are usually "stupid" fouls, created when the opponent was not even in position to score. It's especially "stupid" if the opponent is in the two-shot bonus, or if it is committed with only seconds remaining in a period. We break the court into four segments. Full-court = "80", 3/4 court = "60", 1/2 court = "40", and 1/4 court = "20". An "80" press would be a full-court match-up with a man defending the inbounder. A "60" press would have the man guarding the inbouder drop back to the free-throw line (3/4 court press). A half-court press would be a "40" press. A standard half-court defense would be your "20" defense. Our "80" match-up press may be setup in a 1-Up, 2-Up, 3-Up, or 4-Up alignment depending on how the offense is positioned in their press-breaker. Additionally, our deny presses are "81" (full-court deny) and "61" (3/4 court deny). We also have an adjustment called "Staggered". "80" Match-up Press vs "1-Up"
See the 1-Up diagrams below. Use the press rules described above. We will allow the inbounds pass into the corner. Usually we will not trap the corner in 1-Up since the offense can easily reverse the ball back to the inbounder. Diagram A is the more common situation... as the ball is passed in, X4 sprints to get above the ball. X5 tries to get O1 to speed dribble. If the dribble goes up the sideline, X1 sprints up to double team along the side with X5. In this case, X3 moves to the ball-side sideline to become an interceptor of the next pass up the sideline, while X2 now sprints back to become the helpside safety (X3's original spot). If instead of going up the sideline, the dribbler goes around X5 toward the middle (toward X4 who is above the ball), X4 should be in excellent position to "run and jump" and "hit" (stop) the ball, and X4 and X5 look to trap, while X2 and X1 become interceptors. X3 stays back as safety. We may occasionally trap the first pass in the corner if the inbounder is not a good ball-handler and we want to make him/her handle the ball (see Diagram C). Diagram C, if the ball is passed inbounds below the block in the corner X4 and X5 will trap the corner, while X2 and X1 become interceptors. X3 is back. There may be times when X5 is containing well up the sideline and we want to "cut and double". If X4 follows the rule of "staying above the ball", he/she can watch to see if X5 is able to cut (stop) the ball or causes the ball-handler to spin or turn to the middle. If quick enough, X4 can anticipate this and immediately "hit" the ball there on the side with X5. In this situation, X2 has to understand the situation. If X3 has rotated over to the ball-side sideline, then X2 must be the back defender. But if X3 "stays", X2 can become a middle interceptor when the ball is trapped on the sideline by X4 and X5. "80" Match-up Press vs "2-Up"
Here the offense has two players up at the free-throw line area. Following our rule ("play someone"), we match-up accordingly, and X2 moves up to the free-throw line. All the same press rules apply. X3 may have to move up to half-court to play his/her man, but realizing that if someone goes long, X3 must get back to prevent the layup. If the inbounder runs the baseline and the ball moves up the X3's side, then X1 becomes the safety. If the ball is passed into the corner below the block, we will definitely trap this with X4 and X5, while X2 plays the gap between O2 and the inbounder. If X2 can get the interception back to the inbounder, that's great. But X2 has to be sure he/she can get it, or the press is beaten. If X2 recognizes that he/she cannot get the reverse pass, X2 should then just contain the ball while all other defenders rotate. If the ball is speed-dribbled up the right sideline, the same press rules apply with X5 containing or chasing, X1 will "hit" looking to trap up the side with X5, while X3 rotates over looking to intercept the next pass up the sideline. Notice that X2, once he/she sees the ball going up the sideline, must immediately sprint back as once again X2 becomes the helpside back safetly. Coach Quentin Hillsman (Syracuse University Head Women's Coach). From: "Quentin Hillsman: Adjustable Full Court Pressure"
"80" Match-up Press vs "3-Up"
"80" Match-up Press vs "4-Up"
In summary, this match-up press system is complicated and requires a lot of practice time. To use this system, you must be fully committed to being a pressing team, most of the game and most of the season. Like any press, there are risks and rewards. When run aggressively with energy, you are on the attack and setting the game tempo. Coaches must learn how to make press adjustments during the course of the game, depending on the opponent's press offense. For example, sometimes changing from "80" to "61" can have a big effect. 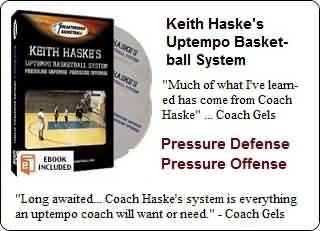 From "Keith Haske's Uptempo Basketball System - Pressure Defense, Pressure Offense"
"Keith Haske: Uptempo Basketball - Pressure Defense/Pressure Offense"
With Keith Haske, Traverse City St. Francis Head Coach, former Charlevoix Rayder Head Coach. 2 DVDs plus eBook included! with Billy Donovan, Head Coach Oklahoma City Thunder, former University of Florida Head Coach. with Forrest Larson, Lake Geneva Badger HS varsity coach. with Rick Pitino, University of Louisville Head Coach; former University of Kentucky Head Coach, former NBA Head Coach (Boston Celtics and New York Knicks). with Gary Williams, former University of Maryland Head Coach.